In April 2017, Jeffrey Sachs, an American economist and special adviser to the UN Secretary-General, visited the University of Waterloo to deliver the TD Walter Bean Lecture on the Environment. “We’re in trouble, and we’re in trouble in ways that we hardly recognize,” he told a sold-out theatre audience, during a talk that progressed from alarm to hope—and strategy—for better living worldwide. 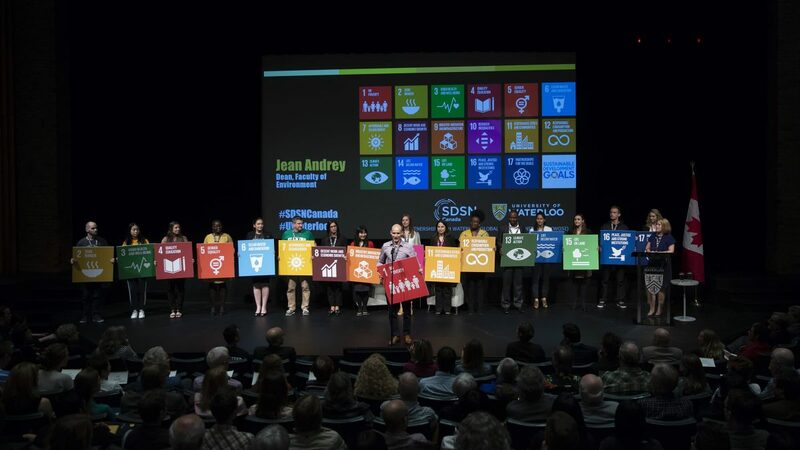 Last May, Sachs returned to the Ontario city to initiate Canada into the UN’s Sustainable Development Solutions Network, and thereby helped put his words into action. SDSN is a global network of 850 post-secondary institutions, civil society organizations and non-governmental organizations that has 26 national and regional chapters around the globe. Together, they are aiming to help countries achieve the Sustainable Development Goals. By UN benchmarks, Canada is in some ways underperforming in our progress to meet the SDGs. We rank 20th out of 156 states, lagging behind Northern Europe and the developed Pacific democracies of New Zealand, Japan and South Korea. The UN suggests, and SDSN Canada agrees, that our weaknesses lie in our climate commitments, our treatment of wildlife habitat both on land and in the water, and our cities’ levels of sustainability and inclusivity. Crucially, the benchmarks also suggest that we have not built the fundamental partnerships that aid in meeting these interconnected goals. Establishing our own SDSN chapter is a significant step in that direction. Within its first year, SDSN Canada has linked 23 member institutions focused on Canada’s sustainability needs, ranging from university engineering departments to business schools to civil society organizations like the 4-H Foundation of Alberta. In the long term, the chapter aims to develop an SDG-focused research agenda, and to help facilitate its members’ research and improve their communication with government and the public. For the moment at least, SDSN Canada is a small shop. It is managed solely by Jon Beale, though it does have access to the resources of its host: the University of Waterloo’s School of the Environment, Enterprise and Development. And there are some recognizable faces in conservation and energy policy advising the chapter, including former Toronto mayor and current World Wildlife Fund Canada president and CEO David Miller, and environmental economist Marc Jaccard of Simon Fraser University. In a 2017 survey, the UN Association of Canada concluded that only 11 percent of Canadians were even aware of the SDGs. Accordingly, SDSN Canada has prioritized sustainability communication and education as one of its four principal concerns. It has several profile-raising projects in development, such as producing materials to enhance sustainability curriculums at the post-secondary level, and aims to consult with the provinces as part of an effort to have sustainable development included in the K-12 classrooms in a more meaningful way. Though Canada trails many of its fellow developed nations, Beale sees advantages to establishing an SDSN chapter later than others. Some of the established regional and national chapters boast successes that SDSN Canada can quickly emulate to incite rapid change. The Australia, New Zealand and Pacific SDSN, for instance, has nurtured productive relationships with the Australian federal government, which now treats the network’s expertise as a valuable resource in evaluating its own progress. One of SDSN USA’s successes in particular has caught Beale’s eye. From 2014 to 2017, New York City, Baltimore and San Jose teamed up with the chapter (which is co-chaired by Sachs) for the Sustainable Cities Initiative, which worked to determine best practices for embedding the SDGs in city planning. With SDSN USA’s guidance, New York has steadily become a leader in SDG cooperation, and now submits a voluntary local review at the UN’s High Level Political Forum on Sustainable Development—the only city to do so. According to Beale, SDSN Canada plans to pilot projects like these in the near future. The chapter is currently partnering with Statistics Canada to develop a sustainability index for Canadian municipalities, and striving to provide new types of actionable data for municipal politicians, city planners and community leaders. Though this project is still in the planning stages, initiatives like these will foster more cooperation between different levels of government and help assure there’s a viable, safe future to plan beyond 2030.